I've never understood the concept of eating apple pie with cheddar cheese, but since they're both things that I love, I knew I had to get this Apple Pie Cheddar Cheese when I saw it. Unfortunately, the apple pie flavor is basically non-existent. You can see swirls of cinnamon and tiny pieces of apples in the cheese, but they don't actually provide much apple pie flavor. 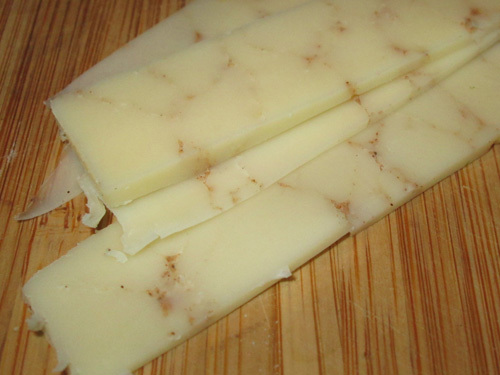 The flavor of the cheese itself is good though, and there's a very slight cinnamon taste to it, but that's about it. 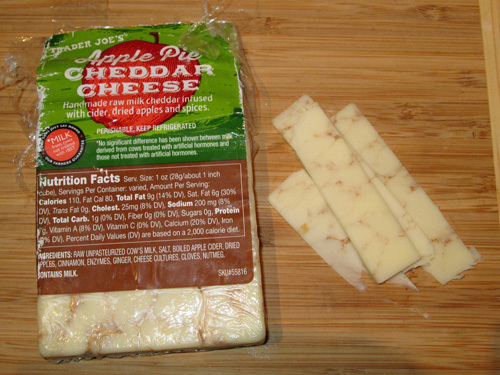 As a cheese, it's good, but don't buy it expecting something special from the apple pie part of it. It's mostly just regular cheese. If you really want to get some apple pie flavor with your cheese, you'll have to buy some pie filling to go with this.